These block volleyball tips are for the traditional blocking jumping technique, not the swing block. You dramatically improve how to block a ball when you jump straight up to block, penetrate your arms and shoulders over the net, while looking at the hitter as they hit and then land in the same spot you took off from. Some blockers jump "up" in one spot and come "down" in another one that's quite far from where they took off. 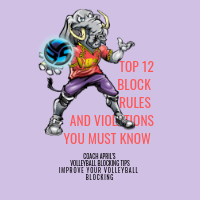 By controlling your body while you jump up to block your hitter you increase the chances of landing in the same spot from where you launched yourself in the air. Why is this one of our more important block volleyball tips? First, because you have three defensive players behind you who are figuring out where they have to position themselves in their back court based on where their front court blockers position themselves to block a ball. 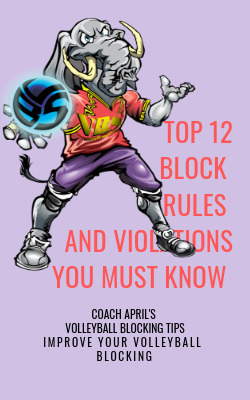 If your block jump is uncontrolled or if you are undisciplined in your block and you end up jumping all over the place YOUR teammates on defense aren't going to know where to set themselves up in the back court in team defense. You can help your sisters out, if you come down in the same place that you jumped up from, every time you block a ball. 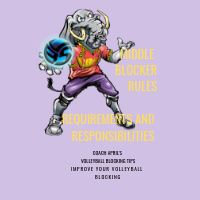 The second reason this is an important blocking tip is because the middle blocker is relying on the outside blockers to help set up a solidly "closed" blocking wall. As you well know, walls don't move around. They stay right where they were built. 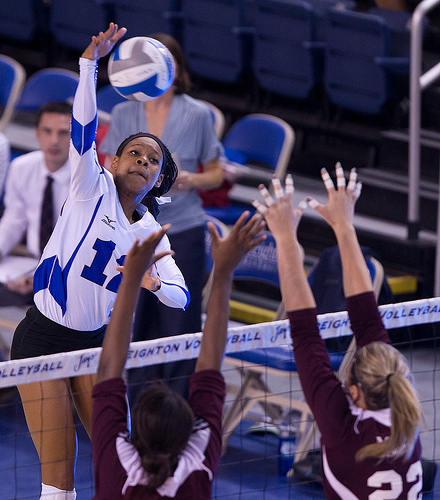 It's your job as the outside blocker to position yourself in front of your hitter's body. Get to your position and don't jump out again or move side to side. 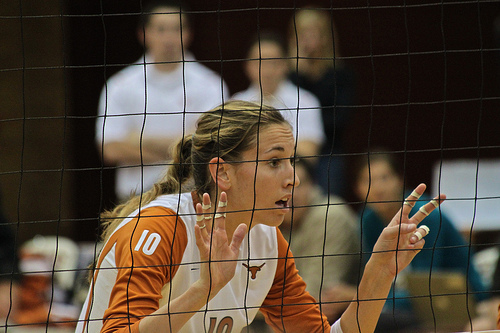 This way your middle blocker knows exactly where she needs to come to close up the block. If you 'fly' or jump to the outside you aren't maximizing your block effectively and you'll never be able to close up that space between the two of you. The other team's hitter will look like a celebrity spiker hitting between that hole you created between you and your middle blocker. 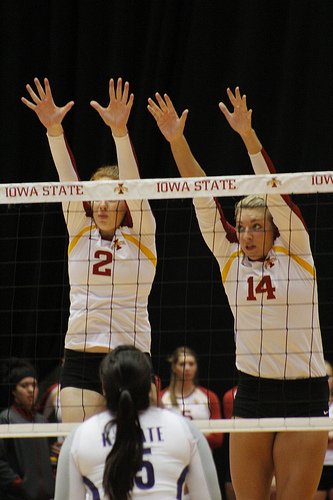 Another way to learn how to block a volleyball efficiently is to keep the palms of your hands up at shoulder height in a ready position. A lot of players and high school coaches have difficulty deciding where the hands need to be while moving along the net to block a ball. 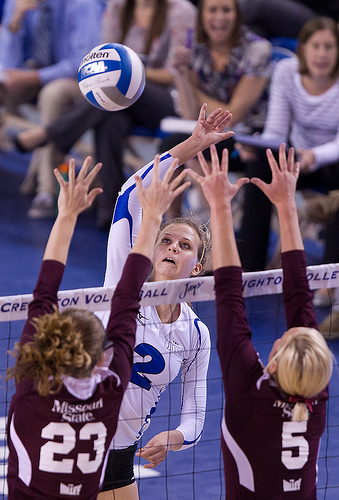 I've seen volleyball coaches teach players to keep their arms fully extended above their heads while moving along the net. This is really too bad because keeping your arms extended above your head while trying to run laterally actually slows a blocker down and doesn't allow them to squat to maximize their volleyball blocking skills by using their full block jump. 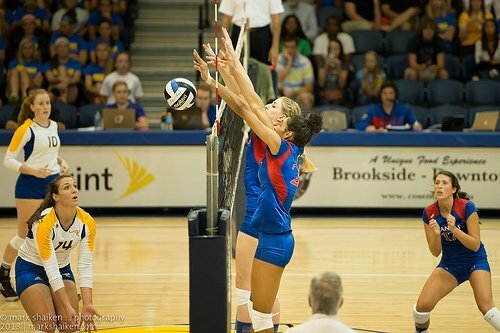 More often than not, I've seen volleyball players of all ages drop their hands and arms way below the level of the net before block jumping in an effort to gain a couple more inches to their jump. 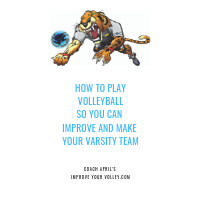 c) actually puts more distance between you and the net because of the extra space needed to swing your arms up in front of you, so you are actually trying to block the ball from farther away from the net which wastes a lot of your vertical jump. "Tiger Hands", "Bear Hands" whatever you want to call it but a front row blocker should keep their "bear paws" also called their blocking hands at shoulder height. More precisely, when you're learning how to block a volleyball you want to keep your hands six to ten inches in front of you with your palms facing the net, your fingers should be widespread, and you want to keep your wrists straight and rigid not bent or limp. When you get in your loaded position with knees slightly bent ready to move left or right you need to hold your hands at the bear paw position just above your shoulders until you are ready to actually block jump. As you jump to block the ball, you need to fully extend your arms over the net as quickly as you can, reaching OVER the volleyball net, without touching it, when you come out of your loaded ready position to block jump. You are literally trying to get your armpits over the net! The lower body positioning you should maintain as you are in your blocking ready position at the net is pretty much the same position you maintain when you do squats during your weight lifting workout in a gym with a bar on your shoulders. 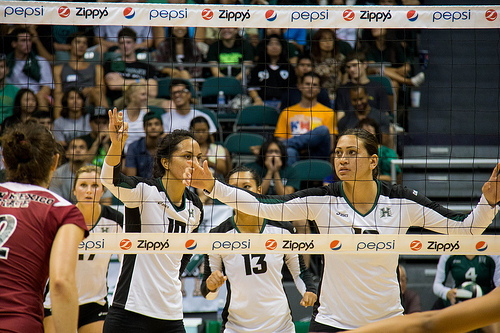 The difference is that a blocker needs to keep their hands inside their body right in front of their shoulders. In the weight room your body is already used to doing this movement over and over again. Legs aren't locked straight, but knees are at a very slight bent ready to run, jump or turn in either direction..quickly! We call this a "loaded" position. An athletic position that allows you to be ready quickly, to spring into action. 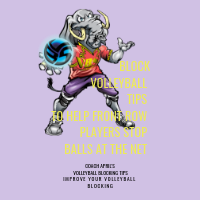 When blocking at the max of your block jump you want to have your arms, shoulders and especially hands angled towards where you want the ball to go, once its blocked. As an outside blocker, you want your blocking hands and arms angled towards the middle of the opposing team's court while penetrating the net to block. The ball will be deflected back into the court and not out of bounds. 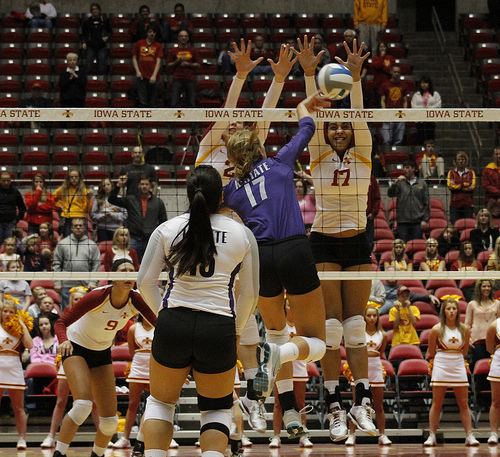 Another thing to remember when you learn how to block a volleyball is to try to fully extend your arms across the net at the maximum point of your block jump. 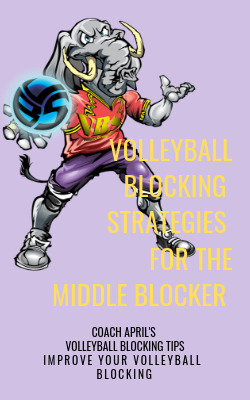 Middle blockers have to block quick sets which are so fast that they only have time to just get there hands over the net to stop the ball. But outside blockers who block 4's and 5's, balls that are set high to the outside or shot out at a quicker pace to the outside have time to use the full extension of their arms to block the ball. If you were born with arms that are 45" inches long then you should be reaching some 45 plus 1 or 2 inches as far over the net as you can get to perform your maximum block jump with your longest arm reaching ability. Another way to maximize your vertical jump when you are learning how to block a volleyball is for you to keep your arms and shoulders fully extended over the net, without touching it for as long as you are jumping. So don't put your arms up there and then pull them away before you've completed your block jump. If you do that, you are defeating the purpose for blocking and you will confuse the defensive players that are in the back court behind you. Hold your arms at their full extension throughout the duration of your block jump, then when you land, land back down into a starting "Tiger Hands " position in case you have to block jump again. Learn more about Blocking by clicking one of the links in the Related Links below.